We have just completed a bunch of great new updates to the ArtWanted Print Program. These changes include higher commissions, new products, more options and more. While this program is normally reserved for Premium Members, all members can order these prints/products of their own artwork as explained lower on this post. We wanted to put more money into the hands of our members, so we have just restructured our entire print program commission plan. Artists will now earn any amount above the wholesale base price of any product. In the past, the artist and ArtWanted split the income above the base price, so this change essentially doubles the sales commission for our members. This change is now in effect for all print program sales going forward on all products. 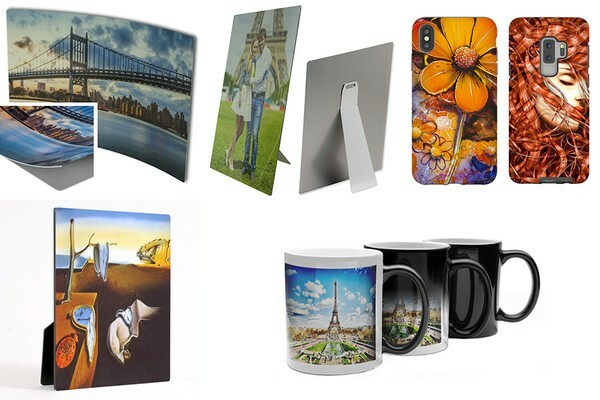 Make your favorite artwork/photos come to life with Metal Prints! Draw attention with these durable and modern additions to any room or office. Over 40 new product options including flat and curved aluminum metal. Available in Glossy and Matte finish. Wall mount and easel finishing options (based on size). Product sizes range from 4x6" to 24x36". Metal thickness is about 1mm. Wholesale price starts at $9.95. We have just added over 30 new phone case options for all the latest iPhone and Samsung phones. Available in both slim and tough case option. We have also lowered the wholesale price on all phone cases to make them more affordable than before. Wholesale price starts at $10.95 per case. A modern twist to the classic framed print this photo panel is sure to jazz up any room or office space. Your artwork is applied directly to the surface of the panel for a vibrant glossy presentation that is ready to display right out of the box. Panel comes with easel. Available in 5x5", 5x7" and 8x10" sizes. Wholesale price starts at $8.95. We have added special filters on the product preview pages to make it easier to purchase the print products. Click a filter button to only show the products you want to see. We have redesigned the order details page that the customer sees after making a purchase. This updated page includes all their order and shipping information in a very easy to read format (mobile friendly, too). If you are a new Premium Member, or you have images in your portfolio that don't have the print product options on them yet, we have a new feature for you. On the FOR SALE tab of the edit image page, you will see a new button to add the print options to your image. This will use the original image you uploaded and if the resolution is high enough, then the print sales options will be added. You do not have to be a Premium member to order any of our print program products on your own artwork. All members can visit our Print Samples page and order any of our 250+ products. Simply pick a product, upload your high-res artwork and we will ship out the product to you. This is a great way to see the quality of our products and try out the print program. Premium members can also use this feature to order prints/products for artwork that is not included in your normal ArtWanted portfolio. These new products are now available on all Premium images that meet the resolution requirements. The new commissions and lower prices take effect immediately. We hope you enjoy these new products and upgrades to the ArtWanted Print On-Demand Program. Glad you like the updates Tyrone. These new products have now been added to all past images that meet the resolution requirements for each product.